How do you extend a contract that was never finished? & What about the PGP? 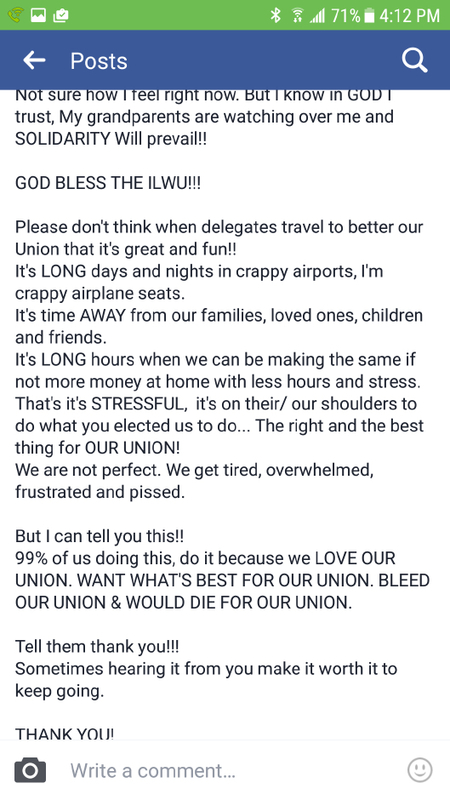 Does anyone remember the ILWU PMA MOU 3-4-15? Why isn’t it on PMA’s website? Where are the Contract books? It has been over 2-years since the 2014-2019 MOU was ratified! Every longshoreman knows, you can’t start a new job until you finish the one you are on. What’s up Big Baby, why are you chiseling? On Friday, April 28, 2017, the ILWU announced the results of their top secret caucus, and surprise, surprise, the caucus is recommending Big Baby’s 3-year contract extension proposal. Using his trademark, do everything in secret so as not to have to deal with any objections or questions from anyone outside the room, Big Baby McEllrath was able to pull his grain contract, “This is as good as it gets,” oka doke to bluff and deceive his caucus into agreeing with his extension proposal. Here is what the oka doke looks like on the ILWU closed Facebook group. 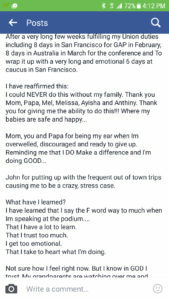 Check out the post from Local 13 Caucus Delegate, Sunshine Garcia. 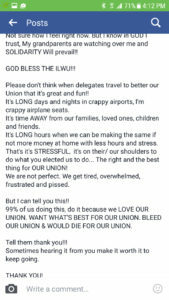 Sunshine puts in for pay for every “volunteer” job she does “for the Union.” Now she is whining about how hard it is to travel the world in Business Select Class, stay in 4-star hotels and eat at 5-star restaurants, but says not one word about what she was there to do, or what she did, or why the 3-year extension is a good deal. Is it all secret? The reason there are no Contract books today is, Big Baby and Jim McKenna cannot agree on what they agreed to regarding the Pay Guarantee Plan, or PGP. I do not know what the exact problem is with the PGP, but if it is big enough to prevent the Contract books from being printed for over 2-years, it is probably worth taking about in 2019. With the robots and computers eliminating jobs by the hundreds, seems to me that the ILWU should be very interested in what is happening with the PGP. It does not matter how much an hour you make if you are NOT working, but it DOES matter how much PGP you are getting if you are NOT working! Section 20.2 Benefits. Effective with the ratification of the contract, PGP benefits for Class A employees shall be a maximum of 40 hours pay each week; PGP benefits for Class B employees who have 5 or more vacation qualifying years as of the preceding April 1 shall be a maximum of 40 hours pay each week; PGP benefits for Class B employees with less than 5 vacation qualifying years as of the preceding April 1 shall be a maximum of 32 hours pay each week. The hourly rate of PGP pay shall be the employee’s appropriate straight time rate of pay as provided under Section 4.13. Seems like a good deal to me, but why are the Contract books not printed? 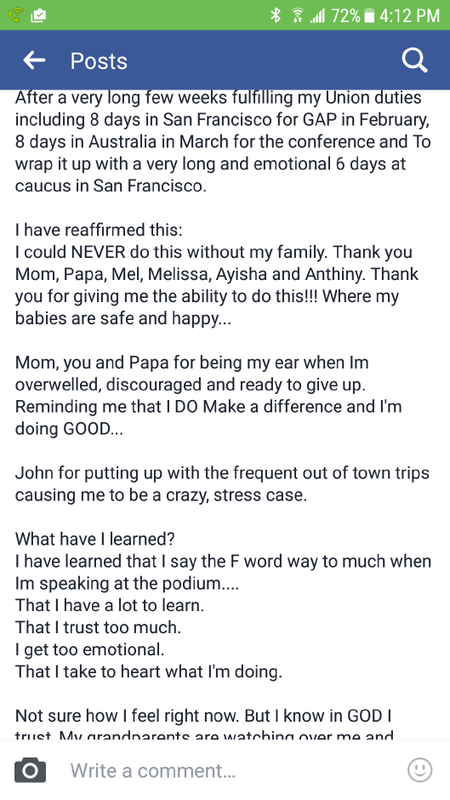 This is just one of the reasons that Big Baby kept a super tight lid on what was happening at the Caucus. WHY? Lets look at the raises proposed for the next 3-years. The average raise in the 2014-2019 MOU was $1.30 per year. The proposed raise for the next 3-years is $1.31 in 2019, $1.35 in 2020, and $1.39 in 2021. That is 1 cent above average in the 1st year, 5 cents above average in the 2nd year, and 9 cents above average in the 3rd year. That is 15 cents above average over 3 years. The cranes are getting taller, the ships age getting bigger, the bridge is getting raised, every one is making lots of money, and Big Baby is agreeable to settling for 15 cents over the average increase for the next 3-years, because he gets his retirement and another Contract under his belt. The history of the ILWU/PMA negotiations suggests that the Union will get at least a 3.1% increase in wages if they bargain in 2019, but it is not about the money. It is about jurisdiction and benefits. The Benefits Plan is still messed up due to the Port Medical fraud, and Big Baby and the Coast are trying to protect the members responsible for the fraud. Does anyone think the Union can get more than 15 cents over the next 3-years, if they bargain in 2019? I do, and I know I am not alone. Harry’s Local, the Mother Local, Local 10 agrees, which is why their membership said no way to extending the Contract.